Zentail provides several features that allow for a better understanding of listing errors. To clear errors that might be affecting your catalogue's products, this article will detail how to locate errors as well as a few tips on resolving errors. If a product has an error, you will see a triangle icon at the top of the product in the Catalogue screen, or on a marketplace 'card' for the product. Click on the triangle icon twice to toggle back & forth between viewing all fields, or only the fields that require attention. The triangle icon will bring you to the listing attribute that is in need of attention. Accessing the Listing Errors Dashboard provides an alternative way to view errors that products might be experiencing. To access the Listing Errors Dashboard, navigate to the main Dashboard in Zentail and click on the Listing Errors card at the top of the screen. 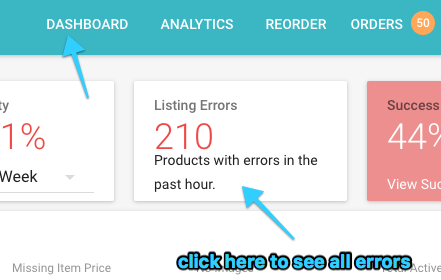 The Listing Errors Dashboard will show you a compiled list of products with errors and the affected marketplaces. Now that you are equipped with the knowledge on how to locate listing errors, here are a few tips on understanding and solving errors. 1. Errors originate from marketplaces. An important point to keep in mind at all times: Zentail displays errors that originate from marketplaces. This means that the errors that you see in Zentail are errors that are written by Amazon, Walmart, eBay, BigCommerce, Shopify, or Jet. 2. Errors do not affect all marketplaces equally. There are many different kinds of errors that a product can experience. Sometimes, there might be an error on Amazon, but not on Walmart. Or, a listing may be just fine on Jet.com, but an error is being sent to Zentail from eBay. 3. You're not alone - errors happen. If you see an error and are not sure how to solve the error, one quick way to find out is to Google the error. Because errors are experienced by all sellers on Walmart, Amazon, Jet, or Ebay, and not just Zentail sellers, chances are good that you will find a fellow seller online who has experienced and solved the same error. 4. We are here to help - chat with our team at Zentail! Solving errors is no easy task. If you could use a hand with error troubleshooting, reach out to us via chat at Zentail. We will be happy to help research and solve errors with you. To search common errors, visit help.zentail.com and search 'error' - our team at Zentail is dedicated to documenting resolutions for errors, and you will find many resolutions here.